Every day entrepreneurs decide to jump into digital printing. Some are startups looking for a new business opportunity, but most are experienced sign professionals upgrading from vinyl graphics. Either way, there are important factors, and potential pitfalls that must be considered. Taking the plunge without thoughtful planning can complicate the transition to digital printing. Some customers get so frustrated that they completely abandon their new equipment. Others simply take much longer than necessary to get through the learning curve and start making money. Since we’re here to help you succeed, we humbly submit this comprehensive Basic Guide to Digital Printing. Here you’ll find some pointers on what to consider before you choose a digital print solution, and what common mistakes to avoid after you’ve chosen your new printer. There are different kinds of inks available with different strengths and weaknesses. Finding success in digital printing begins with choosing the one best suited for the kind of work you plan to do. Solvent and “light” solvent printers use an ink chemistry that includes chemical solvents that carry the resins below the surface of the media, embedding the color in the face film. The primary advantage of solvent-based ink is extended protection from UV exposure, resulting in outdoor durability of three to five years without lamination. And, since solvent inks burrow into the media, they don’t require an ink receptive topcoat. This greatly broadens the range of suitable print media, including unhemmed banner rolls, paper, backlit film and a staggering variety of self-adhesive vinyl. Eco-solvent inkjet printers generally produce a good balance of high resolution and high production speeds with a CMYK based color gamut. The primary drawbacks of solvent-based inks are the solvents themselves. Full solvent printers contain harmful VOCs that are released into the air during printing and drying. These require special ventilation or air purification systems to ensure workplace safety. Fortunately, most sign industry manufacturers have abandoned these in favor of eco-solvent or mild solvent inks which accomplish the same task without the use of toxic solvents and VOCs. They can be used in standard home and office environments without any added ventilation. However, the out-gassing of the mild solvents used does require a waiting period between printing and lamination. Some self-adhesive types of vinyl or print and cut processes also require out-gassing between printing and cutting. Typical applications for eco-solvent printers include long-term outdoor signage, banners, vehicle wraps, commercial window graphics, and, increasingly garment decoration in the form of custom T-shirt decals. This is the same system found in most desktop printers. Large format water bases inkjet printers are most commonly used by artists and photographers but are generally not considered the best choice for sign industry print production. Their advantages include a wide color gamut (with some printers offering up to 10 colors), high print resolutions, and lots of available paper and canvas. The equipment cost for these printers is relatively inexpensive. Their primary disadvantages is a high vulnerability to UV fading because the ink sits on top of coated media where it’s easily degraded by exposure to UV radiation, aka sunlight. Outdoor life for aqueous inkjet prints ranges from a few weeks to a few months unless a UV-resistant overlaminate film or clear coat is added. The other drawback is the requirement of an inkjet receptive coating. Aqueous printers can’t be used with un-coated media. Unfortunately, there isn’t a lot of top-coated media available for sign industry applications like vinyl signs, vehicle wraps, and banners. SIGNWarehouse stocks Sihl 3988 vinyl for these printers and some heat transfer paper in letter and tabloid-sized sheets. Typical applications for aqueous inkjet printers are photography, fine art reproduction, and indoor posters and POP displays. Direct-to-garment or “DTG” printers use water-based inks that adhere directly to the fabric. Well, not quite. These inks adhere only to a pre-treated fabric. The pre-treatment is a coating that’s generally applied by spray or a roller before the shirt is printed. Most DTG printers are designed to print on light and dark garments. Printing opaque images on dark or colored fabric requires the use of white ink. The white ink serves as an under-base that provides opacity and correct color by blocking the color of the decorated fabric. The main advantage of DTG printers is the ability to image full-color graphics to a shirt with the feel of a screen print without the time and labor involved in screen print preparation. Finally, DTG ink is more environmentally friendly than screen print process which includes Plastisol inks and solvents that are not considered CPSIA compliant. Ironically, the drawbacks of DTG printers are similar to those of screen printing. The process of pre-treating the shirts adds time and cost just as the process of burning screens and separating colors adds labor to screen printing. But the main frustration of DTG customers relates to the downside of white ink. The white color and opacity of the ink come from Titanium Dioxide (TiO2). If the printer is left idle, the TiO2 tends to fall out of suspension in the ink, resulting in clogged the print heads and ink lines. Newer DTG printers have adopted internal re-circulation systems that prevent this but at approximately double the equipment cost. Applications for direct to garment printers are limited mainly to printing on cotton shirts, but other applications include canvas bags and other textile decoration. Because of the drawbacks of DTG for garment decoration, a lot of entrepreneurs have opted for laser transfer. Laser transfer is a relatively new field based on the advent of self-weeding laser transfer papers. These papers work in a manner very similar to sublimation transfer paper. When placed on a garment in a heat press, they transfer a printed image to fabric. Self-weeding laser transfer papers use special polymer coatings to transfer toner to fabric without. Different kinds of paper can be used to decorate different items, including light and dark apparel and hard surfaced items like ceramic mugs, wood signs, metallic vinyl, and more. Laser transfer is a digital decoration system that uses toner instead of ink, so there is a cost advantage. Toner cartridges typically yield well over 10,000 pages which makes the print cost much lower than comparable inkjet-based garment decoration products. And, compared to DTG printers, laser transfer startup packages are a bargain. 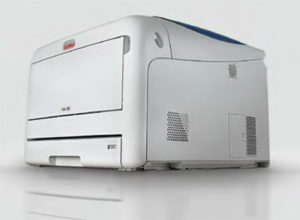 Prices for the iColor 500 system start well under $4,000, a fraction of the cost of a direct-to-garment printer. Typical applications for laser transfer include custom and short-run decoration of light and dark apparel, upscale card stock and commercial printing, and decoration of gift and souvenir items such as mugs, tumblers, mouse pads and the like. 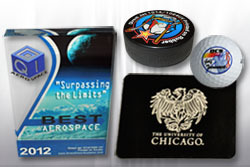 UV-cured ink can be used to decorate almost anything, even a hockey puck. UV cured inks are similar to aqueous inks in that they don’t use solvents to protect the ink from UV exposure. Instead, the ink is instantly cured by a UV lamp which encapsulates it and seals the ink to the face film. This protects the print from sunlight and abrasion. Outdoor durability ratings for UV inkjet printers are not as widely published as that of solvent and eco-solvent printers but are generally considered to be comparable. 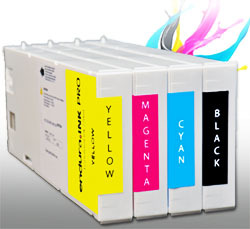 The color gamut of UV cured inkjet printers generally consists of CMYK plus white and clear. Many small format printers have been developed using UV cured inks for the decoration of keepsakes, gift items, personal effects, and awards. The advantage of UV cured inkjet printers are the aforementioned abrasion resistance, which also makes lamination or clear coat unnecessary for abrasion protection. If added abrasion resistance is required, it can generally be achieved by adding an extra layer of clear coat to the ink during the print phase. The inclusion of white ink allows UV printers to decorate non-white media and rigid substrates including glass, acrylic, and metals. UV printers are most commonly used to print directly to rigid substrates like signboard, foam core, aluminum, etc. and are suitable for high speed or high-resolution printing. UV’s drawbacks include lower levels of flexibility of the applied ink. Some are suitable only for rigid substrates. Others can be used on rigid or roll media, but are generally not considered suitable for challenging applications on compound curves like vehicle wraps. Most UV printers do not come with specifically stated outdoor durability ratings. UV cured ink can become ‘uncured’ in direct sunlight since part of solar energy is UV radiation. So don’t assume your UV prints will be as durable outdoors as eco-solvent inkjet prints. Some UV inks have difficulty adhering to corrugated plastic, which is one of the most popular substrates in the sign industry. UV curing equipment also adds complexity and cost and consumes more electricity resulting in higher utility costs. Most UV inks have a satin finish which negates the gloss or matte level of the media so all UV prints tend to look the same. A higher gloss or matte finish may be achieved by adding an overlaminate or separate clear coat. Finally, exposure to an uncovered or poorly shielded UV lamp can cause eye damage if operators don’t wear proper eye protection. Common applications for UV printing range from customizing gifts and souvenirs like mugs and tumblers and plagues, direct print on paperboard for packaging prototypes, and large format applications like direct-to-substrate printing on MDO, and other sign industry substrates. The newest category of ink used in the sign and graphics industry is an old formula that attempts to combine the environmental friendliness of aqueous ink with the outdoor durability of solvent ink. These inks use high heat to cure or encapsulate the ink with the latex and evaporate the water, leaving the resin to bond with media. Many compare the ink with the formulas used in house paint. The most successful of these new latex formulations is now offered by HP and Mimaki. The main advantage of Latex ink is the lack of VOCs which make them appealing to people looking for “green” printing solutions. The added practical benefit of printing without VOCs is the fact that there is no need to allow time for prints to out-gas before they can be laminated. There are drawbacks to latex ink. First, much higher heat is needed for accelerating the curing and outgassing process. Much more heat than is necessary with solvent and eco-solvent inks. The higher print temperatures can cause buckling, unpleasant odors and a host of other issues, especially when printing on self-adhesive vinyl. You’ll find a more detailed examination of the heat-related issues with Latex ink here. Some Latex printers use older thermal print head technology which adds cost and reduces print quality. And, in large format latex applications, the amount of electricity required (usually two 220 volt circuits) to power the heating element can increase installation and operating costs. Typical applications for Latex inkjet printers include posters and backlit displays, soft signage, signs, and banners. Once you’ve chosen the right printer and ink type for your shop, you need to know the basics of RGB and CMYK color space, how to manage file size and image quality, and what kind of maintenance may be required. We’ll cover those topics and more in Part Two of the Basic Guide to Digital Printing.